With its hothouses full of exotic fruits and plants and its pretty riverside location next to Christ Church meadow, Britain’s oldest botanical garden is a charming and colourful place to visit. Combine a visit to the garden with a walk around Christ Church meadow or a summer’s afternoon spent punting on the river Cherwell. Book a guided tour of the garden to learn more about its unique collection of plants or sit on a bench and enjoy a picnic. The botanical garden in Oxford is the oldest in Britain. It was founded in 1621 and like London’s Chelsea Physic Garden, was a place where students could grow and study plants for medical research. Today the garden, which is spread over 4 ½ acres, contains over 8,000 different plant species and showcases one of the most diverse collections in the world. Wander into the hothouses next to the river and among the exotic orchids and chilli plants, you’ll see lemons, clementines, limes and even grapefruit growing. Lemon trees were originally native to Asia and limes were first grown on a large scale in southern Iraq and Persia. The term ‘limey’ comes from the use of limes to combat scurvy among 19th century British sailors. Its use was a closely guarded secret as it gave the British a military advantage. Citrus fruit has an interesting connection with Oxford as it was in the city that Frank Cooper’s Marmalade was first made. You can visit the site of the original Cooper’s Jam Factory which is now an arty café close to Oxford station. As you exit the garden, turn left up the High Street and you’ll see a blue plaque on number 83 dedicated to Sarah Cooper, his wife. She first started making marmalade in Oxford in 1874. Readers of Alice in Wonderland will also know that a jar of Frank Cooper’s Vintage Marmalade was found down the rabbit hole. The average lemon contains about three tablespoons of juice. To extract maximum juice from each fruit, roll it in your hands first and take from the fridge well before you’re ready to squeeze it. They tell me no dogs are allowed in the Botanic Garden except for registered disability assistance dogs. The good news is that you can take me for a walk around Christ Church meadow which is next door. 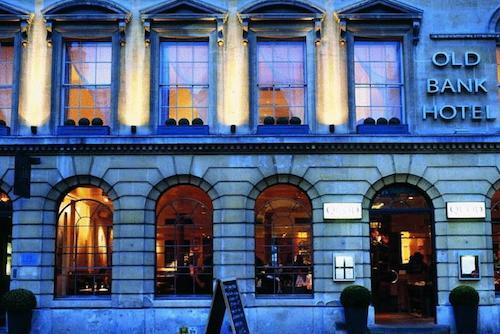 Find more Foodie Things To Do in Oxford. Discover more Gourmet Gardens.